Material It is made of stainless steel 304 /316L. 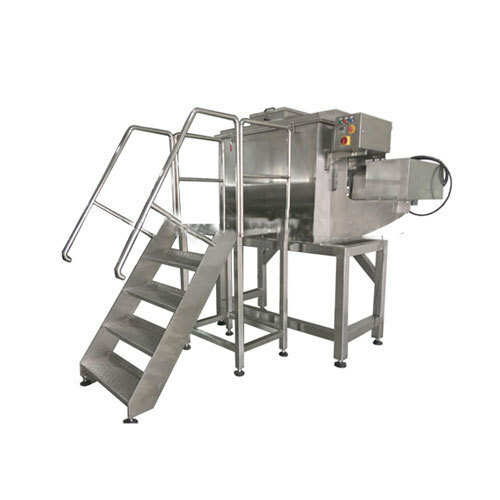 This machine is designed for mixing two or more dry power or granule raw materials from pharmaceutical industry, chemical industry, foodstuff industry and so on. industry, chemical industry, foodstuff industry and so on. The structure of this machine is unique. Its mixing efficiency is high and no dead corner. appearance is beautiful. Its mixing is uniform. Its scope of application is wide. materials like pretty fine powder, cake and certain moist stuff. Established in 2012, We Orchid Material Handling Solutions Pvt. Ltd. is the manufacturer of Pneumatic conveying system, Jumbo bag filling machine, Jumbo bag unloading system, Powder trasfer system, bulk bag handling system, Chain conveyor system, Screw conveyor, Belt conveyor, Drum Fillers, Stoarge hopper, Batch Mixers, Nauta Mixer etc. We create possibilities for technological progressions in our production divisions, to harmonize our generation efficiency, with the soaring requirements of quality products. Our work environment is strategically devised to empower our workforce and to give them current research and development systems so that we can provide to our fullest potential. Our constant workforce shares in the company's profit, by listening jointly to the customer's specifications and, by operating with the agreement to the leading industrial models for production and distribution.